This gracious lady with the keen grey eyes is Joan Rose, standing in the door way of Leila’s Shop in Calvert Avenue on the spot where her father was photographed in 1902, aged six, more than a century ago. I restaged the photo from 1902 with the assistance of the children from Virginia Rd School last year, so I was eager to meet Joan in person and learn something of her experience as a child growing up in Arnold Circus early in the last century. 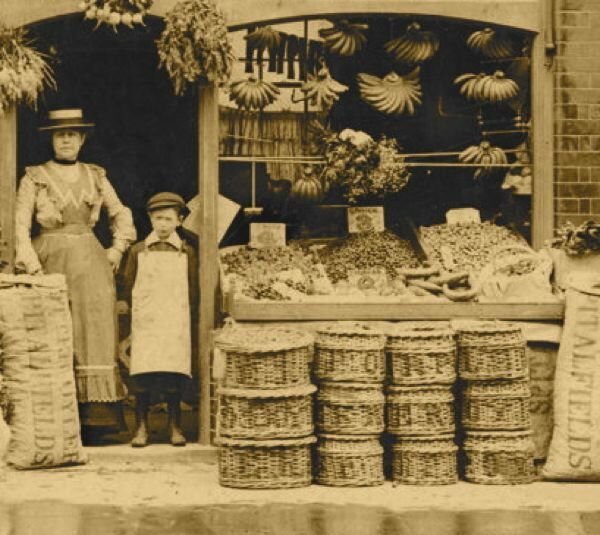 Joan’s grandfather Albert Raymond opened the greengrocer’s shop in 1900, running it with assistance of her father Alfred Raymond, who continued the business until it closed when he died in 1966. Much to Joan’s delight, in recent years Leila McAlister has picked up where Alfred Raymond left off and the place is once again filled with a quality selection of fresh fruit and vegetables for sale. Joan is a remarkably spirited person with an exceptional recall for names and places throughout her long life. An educated woman and former teacher, she can place anyone within London by their accent. Although unsentimental about the past, she talks affectionately about her happy childhood here in Arnold Circus. In 1951 she left to get married and live in Beacontree, but the emotional memory of her time in Shoreditch remains vivid to her. “I am here” she said to me when I met her for tea at Leila’s Cafe and I understood what she meant, even if today she lives on the other side of London. Joan was very close to her grandfather Albert who taught her the exact science of stacking fruit and vegetables in tall pyramids (stalks up for apples, pears, plums and tomatoes, eyes up for oranges) and when he went to Spitalfields Market in the dawn to buy new stock, he took her with him and they had breakfast together at one of the pubs that opened in the early morning. He kept a pony and trap in the yard at the back of the shop and took Joan for rides around Arnold Circus, that was when she learnt that eight times round the bandstand was a mile. 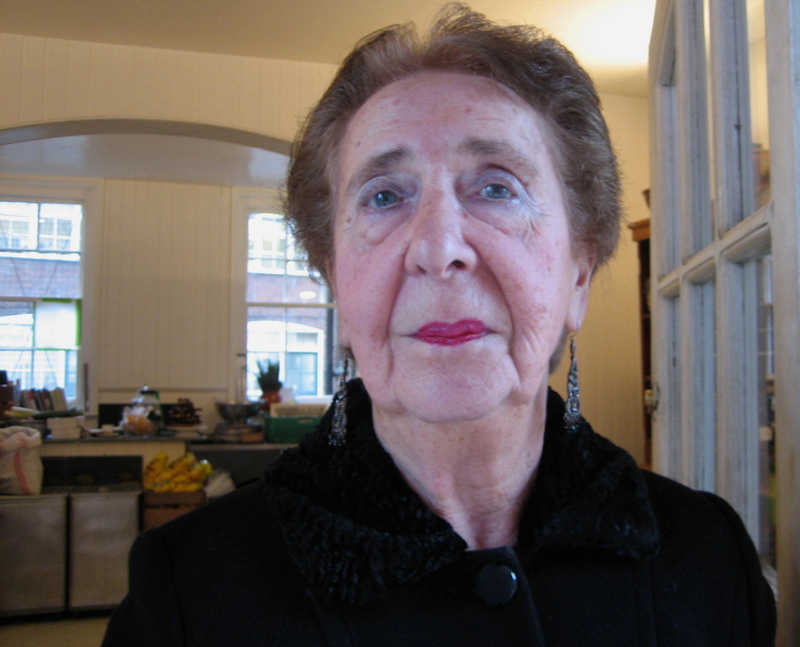 Born in 1926 as the youngest of four daughters, Lily, Vera and Doris being the names of her sisters, Joan’s family lived in a series of different flats in the Boundary Estate as she was growing up, moving at one point from 20 Shiplake Buildings (eighteen shillings and sixpence a week) to 10 Laleham Buildings (twelve shillings and sixpence a week) to save money. Joan never felt that she was disadvantaged by her origins until she and her sisters went up to the West End to dances and met boys who asked where they came from. “If you said you were from Shoreditch, that was the last you saw of them,” Joan admitted to me, “We used to say we were from Arnold Circus because they didn’t know where it was.” Occasionally, charabancs of out-of-towners would slow down outside Raymond’s grocers’ shop and the driver would announce to the passengers “And these are the slums,” much to her grandfather’s ire. Joan’s father was disappointed that he never had a son to carry on the business in his family name but he changed his opinion when World War II came along, declaring he was grateful to have four daughters and not to have a son to send to war. There was a hidden irony to this statement, because he had an illegitimate son, Terry Coughlan, who turned up in the shop once to buy an apple when Joan was serving and her father was out. In a youthful impulse and, to Joan’s eternal regret, she said to her father when he returned, “Your son was here!” Alfred went into the back of the shop, talked with her mother, then came out and said “I spoke to the boy.” That was the last that was ever said of it and Joan never met her younger brother again. Now Joan would like to find him, he will be seventy years old if he lives. Joan describes the burning of London in 1940, when the warden knocked on all the doors in the Boundary Estate, telling the residents to take refuge in the crypt of St Leonard’s Shoreditch. She was not scared at all until she got down into the crypt and saw the priest in his black robes walking among the hundreds of silent people sitting in the gloom, it was this eerie image that filled her with fear. 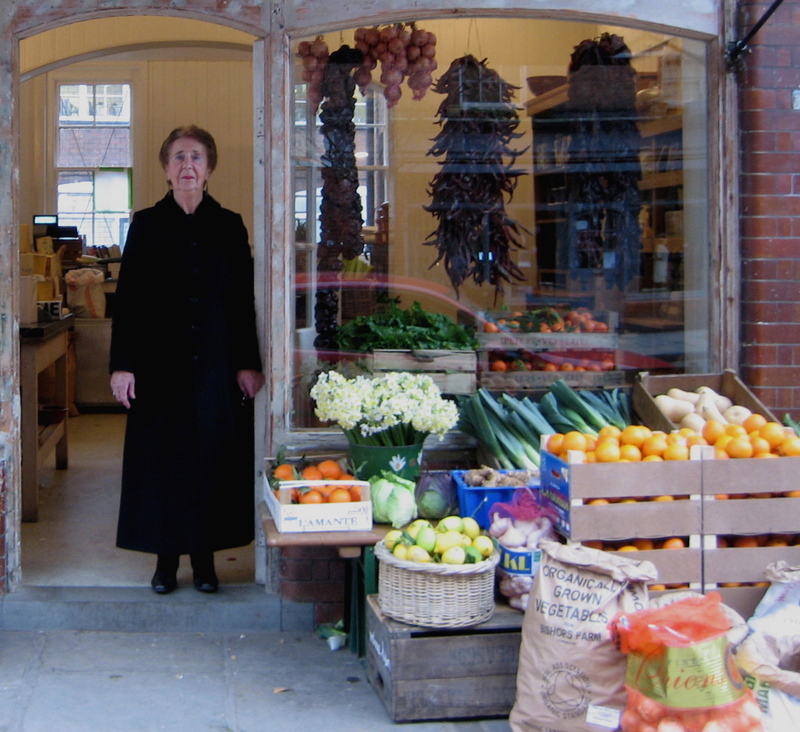 Joan remembers the wartime shortage of onions and the queue that formed outside the shop stretching all the way round Arnold Circus to Virginia Rd when they came into stock. Although her grandfather refused to leave during the London Blitz, Joan’s father took the family to Euston and made the spontaneous choice to buy tickets to Blackpool where he quickly found an empty shop to open up as a greengrocer, and they lived there until the war ended. As they left Euston, the sisters sat crying on the train and the other passengers thought a member of their family had been killed in the bombing, when in fact the four girls were weeping for their wire-haired terrier, Ruff, that had to be put down on the morning they left London. We leave Joan in that railway carriage travelling North, knowing that she will come back to London, get married, have children, become a teacher, have grandchildren, have great-grandchildren and live into the new millenium to return to Arnold Circus and discover that the greengrocers opened by her grandfather in 1900 has reopened again and life goes on and on. When she speaks, telling her stories, Joan fingers the broad gold ring made from her grandmother Phoebe and mother Lily’s wedding rings. Once, it had the initials JR, standing for Joan’s maiden name Joan Raymond, and it was on her husband’s finger but now that he has gone and the initials have been worn away, Joan wears it as a simple gold band to contain all the memories that she carries of her family and of this place. To many of us born later, even familiar history can appear as unlikely fiction, but meeting someone with Joan’s generosity of spirit, eloquence and grace brings the big events of the last century vividly alive as reality. Joan does not bear grievances or carry complaints, she has not been worn down or become in the least cynical by her life, she is an inspiration to us all. Beautiful pictures! Wonderful post – so tender and evocative. This is a most delicately drawn and moving portrait of a remarkable, elegantly dressed and charismatic lady. Fabulous. You probably know Emmanuel Litvinoff’s memoir of life in the East End during the 1930s, ‘Journey Through a Small Planet’. If not, it was in stock in the bookshop at Whitechapel Art Gallery, and may be still. What a moving story – thank you. This is a wonderful story. I am an American, living in the midwest in a small village. We will be visiting London (and Dorset) in July and plan on spending some time in the Shoreditch/East End area. The stories on this blog make this part of London come to life in the most vivid and heartfelt way. We look forward even more to our visit. This lady does indeed look very gracious. I enjoyed reading this post. Thanks. Wonderful. Very moving. Thank you. Wonderful story, and lovely post. I lived in the “buildings” from birth to 1949 when I was married. I remember shopping at Raymond’s for green grocery. the crypt of st leonard’s during the blitz just about finished me. thank you so much. Lovely story and a truly inspirational lady. I really enjoyed reading Joan’s story. I hope she finds her brother.